Bioprocess filtration technology must keep pace with changes in bioprocess fluids. As product streams become more varied, viscous, and valuable, filtration products evolve to accommodate their sometimes unique properties. Filter manufacturers deserve credit for keeping up with the myriad processes, products, and formulations that extend beyond conventional vaccine and protein drugs. Vendors have reengineered filter products by reconfiguring pore sizes and geometries, and altering materials of construction to make their products suitable to a wider range of products and conditions. Additionally, filter modules are inching toward plug and play within single-use processes, even though they not quite there yet. Michael Moussourakis, technical market manager at Pall, notes that while nanoparticle emulsions and liposomal preparations remain on the periphery of biotech therapeutics, “we’re seeing more and more of them, and they present unique filtration challenges.” Pall, Moussourakis says, has devoted “considerable resources” to understanding such complex formulations, and how to handle them through filtration in a way that does not compromise performance or unduly raise costs. In the decade since single-use components entered mainstream bioprocessing, the marketplace has been turning from individual components toward subassemblies, systems, entire processes, and even whole facilities. “It’s reached the point where manufacturing plants have become single-use entities,” Moussourakis says. 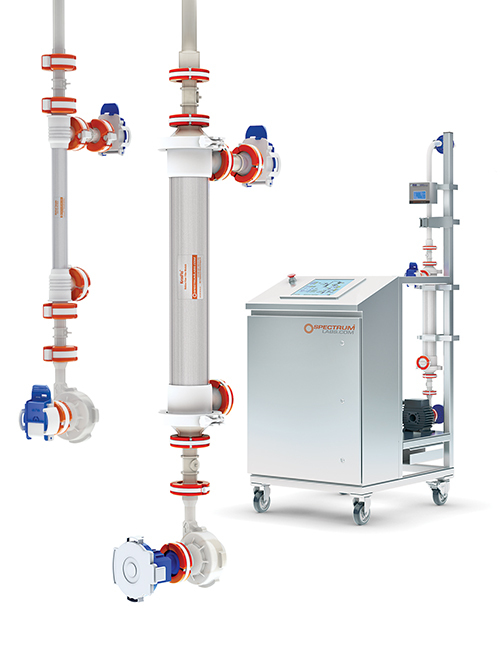 Although single-use has not quite yet matured to the point where customers can dial in and have any type of system gamma sterilized, dropped off, and ready to use, filters (and other components such as biocontainers and sterile connection/disconnection devices) are mostly plug and play. With titers and cell densities rising, concerns over costs and quality are increasing, and risk mitigation has become the prevailing mindset. Single-use processing is but one component that facilitates risk-based manufacturing. Since filters come into intimate contact with process fluids, materials of construction are critical to how filters fit into the “disposable” scheme of things. Consequently, one might think that by now, a full decade into single-use biomanufacturing, the issue of leachables/extractables would be settled. It isn’t, Tkacik explains: “Increased regulatory scrutiny and a broader desire for risk reduction are causing users to demand more information on filtration products. “Biomanufacturers want to understand how filter materials might interact with process components and affect drug substance quality and stability. In addition, many users want to understand the manufacturing process and supply chain that supports their filtration products,” adds Tkacik. Vikas Gupta, business leader for bioprocess filtration at GE Healthcare, notes significant emerging trends in bioprocess filtration: increasing filter integration with single-use systems, focus on reducing holdup volume, improved process monitoring capabilities in single-use filtration assemblies, and the resurgence of hollow fiber membranes. The integration idea is related to ease of use. “The industry first transitioned from cartridges to capsules. Now we’re connecting capsules to single-use sterile connectors at the time of filter assembly, which offers a sterile, pre-rinsed, pre-washed sub-assembly right out of the box,” Gupta says. “This design reduces the number of connections, thereby reducing the risk of failure, and makes the filtration assembly optimally suited for use in a gray space environment.” GE’s ReadyToProcess filtration devices are one such offering in the market. Due to the high value of process fluids, filter holdup volume has always been an issue in biopharmaceutical manufacturing because holdup equals lower product recovery. Holdup is becoming more serious now as processing volumes decrease and titers rise. Today, manufacturers employ various techniques to reduce holdup, but these add extra steps to the process. “Instead, the industry is trying to address the hold-up volume challenge through redesign of the filters themselves,” Gupta says. Improving capacity has always been an issue for bioprocessors and filter vendors, particularly as product volumes and/or titers increase. Additionally, users seek simplicity, robustness, and consistency in filter products, characteristics that help control processes more tightly. “That speaks to virus filtration products that do not show lot-to-lot variability, and that work with a wide range of pipeline products,” comments Michael Morgan, Ph.D., vp of business development at Asahi Kasei Bioprocess. Virus filter capacity has become a major issue in this era of risk-mitigation and risk-based manufacturing. Bioprocessors who strive for a target log virus removal have no way to know how much virus their processes harbor, if any. Manufacturers expect that viruses coming through from ingredients and buffers are minimal, and that infectious agents arising from the expression system follow historical patterns. But in the end, virus removal becomes an exercise in statistics. In general, lot-to-lot consistency may be an issue for some filters because variability exists in the manufacture of membrane materials, and in how filter materials interact with process fluids. Pore sizes that are slightly larger or smaller, pores with slightly off-spec geometry, and variations in chemical makeup all contribute to variable performance. Similarly, process conditions that change during development, such as pH, salt concentrations, and hydrophilicity, affect how the process interacts with the filter. Bioprocessors must beware of pathogens inherent in their expression systems, potential pathogens in ingredients and buffers, and those that enter the process from the environment or through worker contact. Although viral clearance formally begins with the first purification step, definitive virus filtration occurs late downstream. Recent concerns regarding new viral and bacterial contaminants, however, have caused a whole-process rethinking of pathogen removal. For example Mycoplasma, the smallest known free-living and self-duplicating microorganisms, are particularly destructive and difficult to eradicate. Genentech’s 2012 presentation on Leptospira contamination opened the eyes of many to the dangers of complacency with regard to novel organisms that have not previously been encountered in cell culture and fermentation. A poster, presented by Genentech scientist Ting-Kuo Huang, Ph.D., described the pathogen as “adventitious,” having been discovered “during routine microscopic visual examination.” Genentech considered the problem serious enough to warrant publicly exposing what is typically considered a trade secret. “These concerns have led biomanufacturers to consider pathogen removal already at early process stages, which includes virus filtration, for certain cell culture media or media components,” says Holger Bromm, director of filtration technologies at Sartorius Stedim Biotech. Although virus filtration occurs late in purification, bioprocessors are uneasy with the notion of potential contamination persisting from one purification step to subsequent operations. “If you can detect contamination in your bioreactor, it is unacceptable to proceed further with downstream processing,” Bromm explains. Chemical or heat treatments are two alternatives to filtration for eliminating early-stage contamination. But not all products and processes stand up to such treatment, and at their best they complicate the process by adding steps. To enhance a filter cartridge’s performance, the cartridge’s filter membrane may be pleated, enlarging the membrane’s surface area, which directly affects flow rate and total throughput. Twinpleat technology, from Sartorius Stedim Biotech, is characterized by an alternating sequence of longer and shorter membrane pleats, positioned in a specific angle. Since perfusion cultures are continuous, filters must be capable of allowing product to flow through without harming cells or product. The special requirement of continuous processing has thus far limited options for companies simultaneously seeking the benefits of perfusion culture and single-use filtration. “Processors did what they could to extend filter life and extract as much product as possible,” accordingo to MacDonald. Spectrum uses industry-standard sterile barrier connectors from Colder Products as their default setup, but can accommodate customer preferences for other vendors’ connectors. Spectrum Lab’s KrosFlo® Perfusion Single-Use Flow-Path Assemblies and System. Direct filtration costs are quantified by performance—flow and throughput. Maximizing these characteristics helps users minimize the number of filter products they use, and thereby reduce costs. 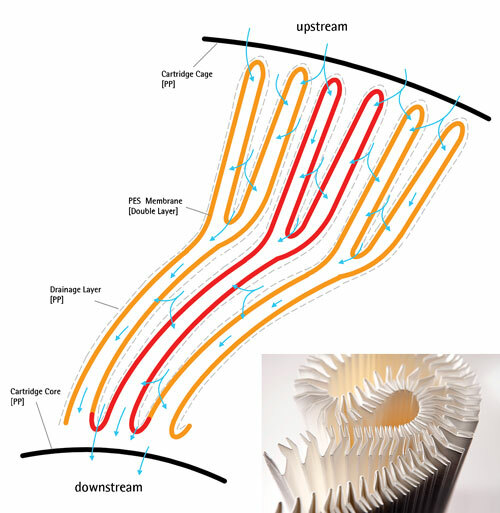 From the filter vendor’s perspective, this has involved what Holger Bromm of Sartorius refers to as “continuously upgraded performance” that involves improved membrane structures and incorporating greater surface area within filter elements. For example, the Sartorius Sartopore Platinum, which employs the company’s Twin Pleat technology, provides one square meter of surface area into a 10-inch cartridge. Bromm also mentions indirect costs as a critical decision-driver for selecting bioprocess filters. Integrity testing, for example, involves wetting for five minutes at 0.3 bar differential pressure. Practically speaking, this requires up to 120 liters of water for injection (WFI), at a cost of up to $3 per liter. “In 95% of cases where cartridges fail, the cause is insufficient wetting,” Bromm notes. By improving the wettability (hydrophilicity) of membrane materials, Sartorius claims to have reduced the WFI demand to five liters for a 10-inch cartridge going along with a significant cost saving for the user and eliminating troubleshooting and retesting of filters.